We are an experienced passport and visa photo business that can take care of any order, no matter how specfic the application requirments are. You won't have to worry about spending time and money going to a physical store, but can have the luxary of speeding it up. We have thousands of satisfied customers around the world. 3. We'll crop the photo to the correct requirements and have them delievered to you. Why order Passport Photos online? Save Money: No need to spend $12-15 for 2 photos at your local Walgreens or CVS Pharmacy. 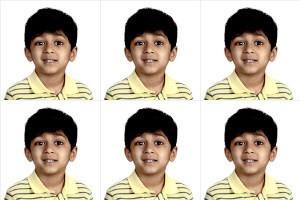 We will give you 6 passport photos for only $7.95. Order 12 photos for only $10.90! Convenience: Get photos mailed to you anywhere in USA. Or pick them up at your local store within a day. (How does this work?). Need photos for the entire family? You can order photos for whole family right from your home. No need to drive and waste time at the store. Passport Photos for any country, in any size: 2x2 inch photos for USA, 35x45 mm for UK, Australia, Canada and many other countries, 33x48mm for China, or in any size that your visa or passport application asks for. Passport Photos for Babies, newborns or toddlers Newborns and babies often fall sleep when brought to the studio or some may be too young to keep head straight or eyes open. We are a lifesaver for most parents. Take photos of your child in your home at the most convenient time and we will make passport photos that will be amazingly beautiful and compliant with all government requirements. Our photos are rarely rejected but if passport office finds any issues with your photos, we will do your photos again for free. We will verify your photos and email you a link so you can place your order quickly. A note: There are some websites that offer free cropping of your photo but most of them do not fix or enhance your photos! They just trim your picture and provide you a photosheet! In our experience, most of the photos taken by nonprofessional photographers need manual enhancement/fixing with regards to photo background, removing red-eye, fixing exposure and/or removing shadows created by flash. As a Professor and International Lecturer, I often have to travel around the world and to many countries that require a prearranged Visa. As part of the application for such a Visas, I need one or more passport photos to submit. With all of my travels, this adds up to a lot of passport pictures over the course of a year, and that can be quite costly when you can only have 2 made for $10 or $12 at discount locations Costco or the AAA. Even then, the pictures are always different than that in your Passport, which can also lead to difficulty getting them approved. More importantly, a great many countries require 35x45 mm photos, not the 2"x 2" ones used in the USA, so getting those at the locate Costco, AAA or photoshop is nearly impossible. But now there is OnlinePassportPhoto.com who solves all of these problems and more with their passport photo service. Not only does OnlinePassportPhoto.com provide passport photos in both US and international sizes at very reasonable prices, but one can get any number of identical images for use as needed. By taking ones own digital pictures at home or work, with the expert guidance they offer in the instructions and tips on their website, OnlinePassportPhoto.com helps one to take the best picture and reviews it to ensure it will pass inspection by the most demanding of customs and immigration officials. In fact, even imperfect pictures they professionally touch up, such a removing pesky shadows and lightening images. For the price, or any price for that matter, the service is outstanding with responsive customer service to all questions no matter how insignificant. Replies to my emails were fast and very efficient. For your Passport photos need, whether you in LA, NYC, Chicago, Houston, Boston or San Francisco, it does not matter. We can help you online for any types of passport or visa photo needs.